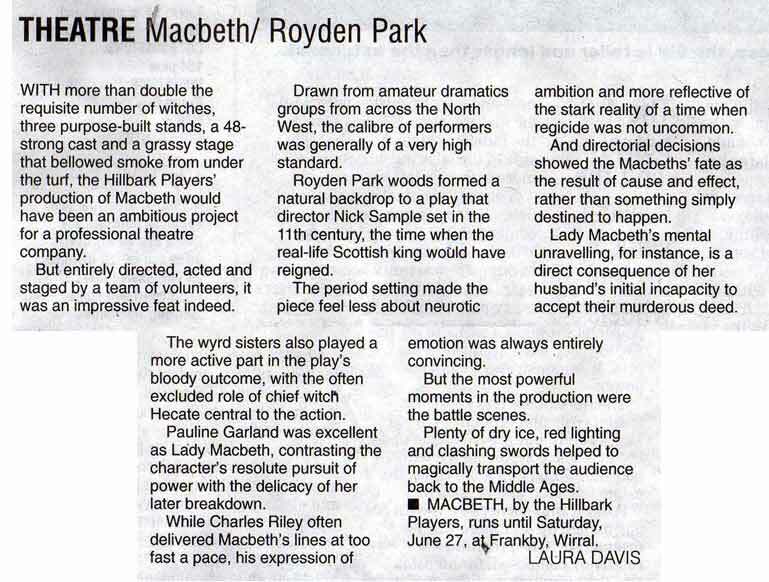 WITH the onset of night and with the birds twittering their final song of twilight, a murder most foul is being enacted for around the millionth time in over 500 years at Royden Park in Wirral and rarely have the actions of Macbeth been better demonstrated. 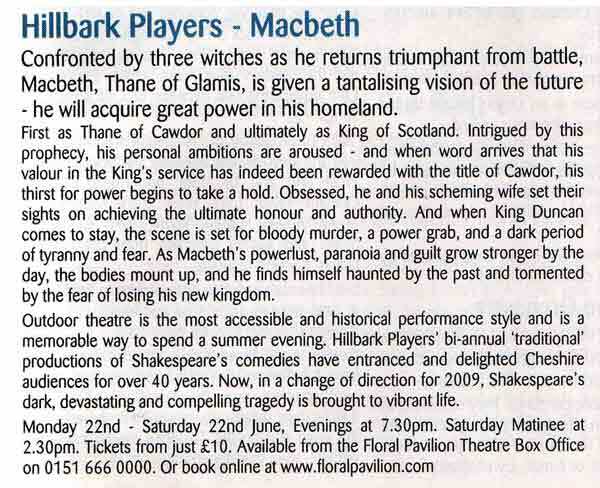 In short, The Hillbark Players 2009 production of Macbeth is an absolute joy and I urge you to see it for yourselves. The costumes are superbly authentic right down to the silver beads on the handles of the dirks and broaches holding together the kilts. The stage set, though simple, is highly effective thanks to some wonderful use of pyrotechnics - with the highlight being and ingenious employment of such during the "cauldron" scene - and the acting is, for the most part, from an incredibly large cast, exemplary. Stand out performances, as might be expected, come from those in the guise of Mr and Mrs Mac, here performed by Charles Riley, who manages scowling rage, duplicitous nice guy and tormented agony brilliantly, and Pauline Garland who's every mannerism is etched deep with the self-serving cold-heartedness demanded of her character and who's delivery is faultless. Another important fact is that despite the cast declining to use microphones, not a single word is lost to the audience as is the case in so many outdoor productions, and this should act as a template for many a larger company who attempt to take Shakespeare al fresco in future. "By the pricking of my thumbs" to paraphrase the great Bard, "something exceptional this way comes" and for all those involved in this production of "The Scottish Play", there should be a tremendous sense of achievement because, without doubt, The Hillbark Players have managed to pull off something that can rank with a great many larger company's efforts with style and aplomb. 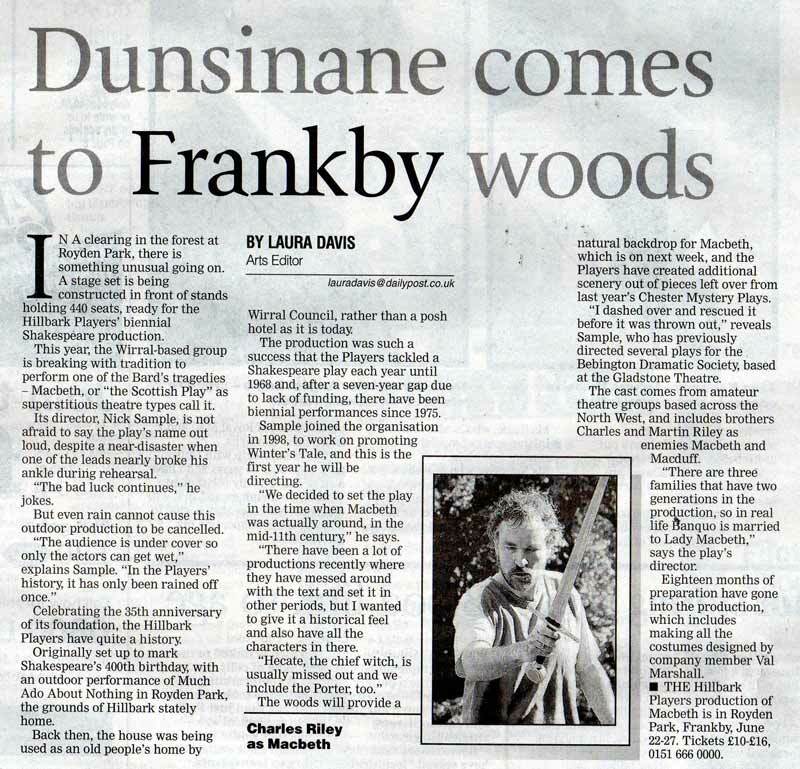 The Hillbark Players Production of Macbeth in Royden Park, Frankby can be seen until this Saturday, June 27, 8pm start. "By the pricking of my thumbs" to paraphrase the great Bard, "something exceptional this way comes". For all those involved in this production of "The Scottish Play", there must be a tremendous sense of achievement, as The Hillbark Players have managed to pull off something that can rank with those of a great many larger companies in terms of style, aided and abetted by the natural surroundings and aura of one of Wirral's finest public areas. The costumes are superbly authentic right down to the silver beads on the handles of the dirks and broaches holding together the kilts. The stage set, though simple, is highly effective thanks to some wonderful use of pyrotechnics - with the highlight being an ingenious employment of such during the "cauldron" scene - and the acting is, for the most part, from an incredibly large cast, exemplary. Stand out performances, as might be expected, come from those in the guise of Mr and Mrs. Mac, here performed by Charles Riley, who manages scowling rage, duplicitous nice guy and tormented agony brilliantly, and Pauline Garland who's every mannerism is etched deep with the self-serving cold-heartedness demanded of her character and who's delivery is faultless. It will be a long time before anyone sees a finer demonstration of Lady Macbeth's somnambulistic ranting, or one that is more heartfelt. Yet it is not only these but those who surround them that shine. Simon Garland as Banquo is quite superb in the role, giving the character a slightly confused edge and a steely determination that blend well into his ultimate demise and "rebirth". Of all the Witches, Rebekah Tolcher holds sway amongst those on show, demanding that people listen to her and almost directing those other Wyrd sisters on show. Lucy Clement is incredibly powerful as Lady Macduff. Even though her time on stage is brief, she nonetheless leaves an indelible sadness with the audience at her cruel demise, whereas Martin Riley's Macduff grows into being as bold and forthright as he should be. Yet of all these, the real plaudits must go to Andrew Nance who's timing, energy and delivery as Malcolm mark him out as one to watch. Hi chaps, just had to say what a great evening we had. Superb production and cast-how do they learn all those words? Even the rain didn't dampen the evening. I heard every word AND understood the story. Well done! 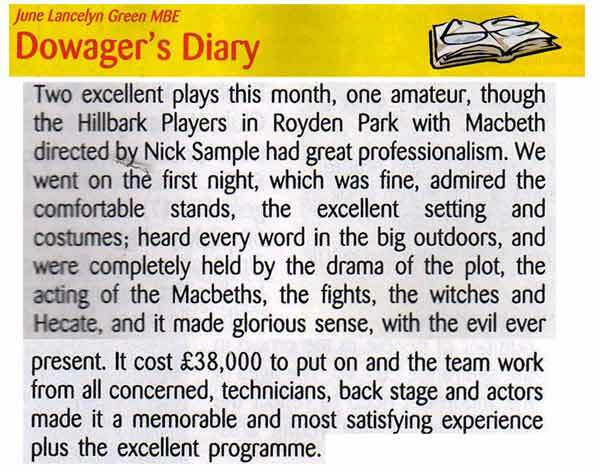 Can you pass on my congratulations to the Hillbark Players for a truly wonderful performance of Macbeth. I attended on the Wednesday evening, and thoroughly enjoyed the whole experience. The acting, costumes, set, and especially the music, which first attracted me whilst walking across the common on the Sunday evening. Like a siren, it drew my attention, and made me want to see the play. I was not disappointed. The friend I was with had recently seen Julius Caesar at Stratford, but thought your performance much better, so there is an accolade! Ann and I would just like to say a very big thanks to all of you for making last Saturday such a great evening. Each of you contributed in a number of ways - from creative ideas to taking practical steps to make sure the evening went as smoothly as possible. And it really paid off - as you can see from the below extracts from emails I've received since Saturday. We had a wonderful time; the location, the play ( absolutely outstanding). Thank you very much for the invite to the play I'd never seen Macbeth before so it was a treat for me and I thought they were a very good cast! �..... what was a really good production of Macbeth, made for a memorable night. We adored the play and thought the production was amazing. We try and go every time it is on but did think that this was one of the best Hillbark Players have put on. I particularly enjoyed the Scottish Play which was certainly one of the best productions, if not THE best, that I've seen done by the Hillbark Players- brilliant costumes and atmosphere and all the better for being done outside.